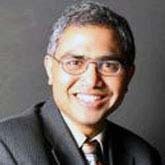 Sandeep K. S. Gupta joined Arizona State University in 2001. Prior to joining Arizona State University, he held academic positions at Colorado State University (1996-2000), Duke University (1995), and Ohio University (1995-1996). Gupta's research interests include mobile and pervasive computing (location management, data caching, context-aware computing, and middleware), wireless sensor networking (energy-efficient and reliable data dissemination and aggregation protocols, security, and biomedical applications), and parallel and distributed computing (thermal-aware task allocation, multicast and broadcast protocols, and energy-efficient self-stabilizing protocols).